Microsoft's new CEO, Satya Nadella, is shaking things up at the company with a major reorganisation at the top, with Tami Reller and Tony Bates both reportedly leaving the company. Named as the new CEO early last month, Nadella inherited the aftermath of a serious reorganisation by former chief executive Steve Ballmer. 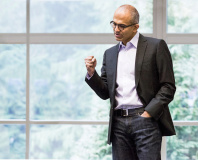 Not content with merely following his predecessors legacy, Nadella is reported to be making his own mark at the top - beginning with the departure of two big names at the company. According to 'people with knowledge of the matter' speaking to Bloomberg, Nadella's new strategy sees Tony Bates - who was considered in the running for the post of CEO until Nadella's appointment - and Tami Reller leaving the company. Their respective posts will be taken over by internal candidates Eric Rudder and Chris Capossela. 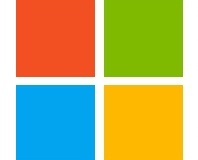 Reller, Microsoft's marketing vice president, is perhaps best known for having been the public face of Windows 8 and 8.1 following the departure of Steven Sinofsky in November 2012. Her departure marks the end of a 13-year stint at the company. Bates, meanwhile, was considered at the front of the race for the position of chief executive until Nadella's appointment. 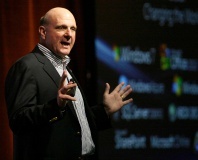 Both received vice presidency positions in July of last year, under Ballmer's auspice. Microsoft has not commented on the reports, nor has it provided guidance for investors on Nadella's supposed executive reorganisation. Former CEO retains shares, though.